If you know me, then you know I love beer. I love trying every kind of craft beer I can get my hands on. So when I heard there was a beer spa, I knew I had to add it to my bucket list. 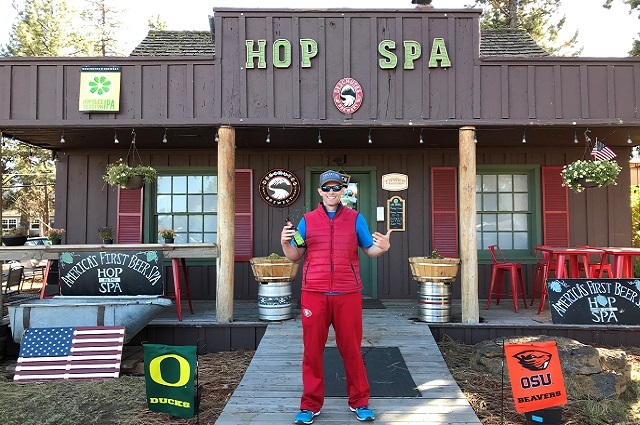 Located in Sisters, Oregon, Hop In The Spa lies about 150 miles south and a bit east of Portland. I heard about it through social media and knew I needed to go there. So a group of us planned a trip to Bend—about 30 minutes from the spa—and called to get a reservation. Turns out, reservations are a must, as they only have two tubs right now, but are adding more. They also have a massage room in which you can get rubbed down with hop oil (insert ‘a hoppy ending’ here). But I was more interested in getting into a tub of beer. When we arrived, we met Mike and Sally, two very engaging personalities who told us the story of how they met and opened the only beer spa in North America. However, they are planning on opening another in Virginia, so East Coast fans look out. While they prepared our Microbrew Soak in their solid cedar tubs, we sat in a bar area. They served up some hard-to-find Deschutes Brewery beer and got us in the beer state of mind. We then walked into the Soak Suite that holds two steaming, full tubs, and the aroma was awesome! Let me explain one misconception. You are not actually sitting in a pool of beer. You are sitting in heated water in which they mix all of the elements of beer into the tub, except yeast. Hops was one of the main ingredients, and you can see them floating on top of the water. Once in, it felt amazing, smelled great, and I was face-to-face with what I love—hops. Then they came in and gave us each a fresh Bavarian pretzel with a specialty beer mustard and a cold beer. Maybe this is what heaven is like? The spa currently offers three microbrew-inspired soaks from a 30-minute pale ale to a 40-minute porter to a lengthy full-hour, barrel-aged stout experience. Prices range from $79 to $109 with discounts for couples. Add in an hour therapeutic massage with a hand-crafted hop oil for another $100. Our 30-minute soak ended too soon, and we went back to the bar area while the next party in our group went to soak. We made an afternoon of this event. 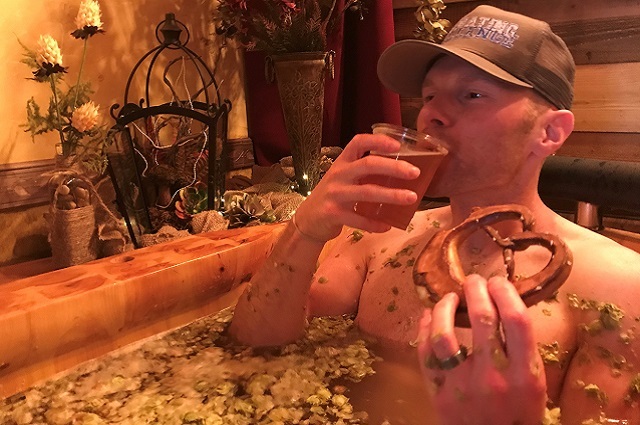 If you’re looking for once-in-a-lifetime experiences for the beer lover in your life—or yourself—then add this one to your list and Hop In The Spa!